GLOBAL AWARENESS 101 - Let your VOICE be heard and get involved. OUR future depends on it! : Mountaintops or Valleys: Which Do You Prefer? Mountaintops or Valleys: Which Do You Prefer? Mountaintop experiences sound much more appealing of course! 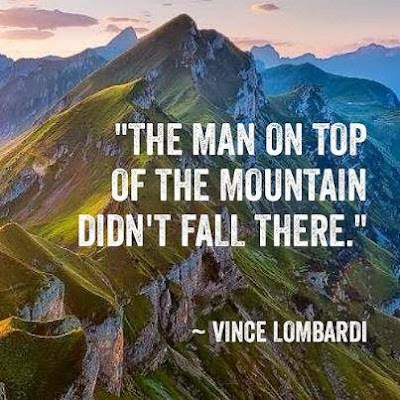 Who wouldn’t want to be living on top of the mountain having successfully maneuvered and climbed to reach that destination, that moment, where you can scream it from the mountaintop “I did it…I arrived…I made it”. Releasing a big “Yes”. What exclamation, what passion, what celebration. A triumphant moment to be treasured and memorialized for certain! But let’s not discard the treasures we learn in the valleys. For it is in the valleys that the fruit is grown. It is in the valleys that growth occurs. We gain wisdom, develop roots and learn to live tenaciously. 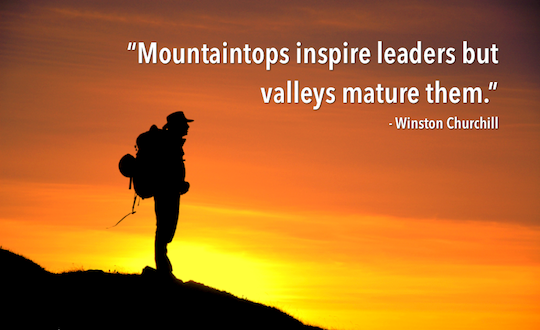 Winston Churchill says it best “Mountaintops inspire leaders but valleys mature them”. Did you ever meet a leader who seemed to climb that mountain effortlessly and almost instantaneously? You blinked and all of a sudden there they were standing on that mountain. Success made easy. They started sharing their 5 Steps to Mountaintop success and people flocked around them to learn their secrets. They enjoyed their position of leadership, success and fame. But somewhere along the way they missed the lessons learned in the valleys and at the first sign of storms, they crumbled. They hadn’t the strength to stand firm. They hadn’t the endurance to keep pressing on and before you knew it they were cast into the unknowns. Time passes and their name fades from our memories. Lesson #1: The ground is fertile in the valley. Typically when we are in the valley, we are more “fertile”. We are open to receive instruction, wisdom and seek advice. When we are on the mountaintops, we don’t feel the need for any input. Take this time to improve your skills and talents, seek out those that could mentor or help you. Look at those in business that you admire and go talk with them. Be open to lessons you can glean during this time. Lesson #2: The fruit grows richer in the valley. The result of the valley experience does mature us. We see the “fruit” of increased strength and stamina. We see the “fruit” of courage and commitment. We see the “fruit” of persistent determination and tenacity. We have faced some of our greatest challenges and we have survived. The fruit grows sweeter and so nutritious. Lesson #3: There is only one way to go – up! We may have descended to the valley, camped out at the valley but we are not staying. There is only one way to go and that is up! We look for new opportunities. We look for ways to utilize our current resources. We take what we have learned with what we have in our hand and we set out on the journey. Knowing full well that we will be breathing that cool fresh air and savoring those incredible views once again. Yes, the valleys bring much reward, just a different view!